On the basis of valuation measures most closely correlated with actual subsequent 10-12 year S&P 500 total returns in market cycles over more than a century, a ranking of the most overvalued extremes in U.S. history, in order of severity, includes: 2000, 2015, 1929, 2007, 1937, 1907, 1968, and 1972. While the 1969-70 retreat took the S&P 500 down by only one-third of its value, each of the other instances was followed by market losses of 50% or more over the completion of their respective market cycles. Given that 2015 is the second highest valuation extreme on record, such an outcome is not some worst-case scenario, but is instead a rather run-of-the-mill expectation. Notably, the 2000 market peak was dominated by large-capitalization stocks and the technology sector. The recent Fed-induced speculative bubble actually brought the valuation of the median stock beyond the 2000 extreme, marking the most offensive point of overvaluation in history for the broad market. A 50% market loss would not even bring the most historically reliable valuation measures materially below their long-term averages. The following chart, showing the ratio of nonfinancial market capitalization to corporate gross value added (red line, left scale, inverted) versus the actual subsequent 12-year nominal total return of the S&P 500 (right scale), places current valuations and prospective returns in a historical context. In our expectation, the likely total return of the S&P 500 over the coming 12-years is likely to be approximately zero, though with one or more extraordinarily deep interim losses on the way to zero overall returns. Recall that the same outcome emerged in the 12-year period following similar valuation extremes in 2000. 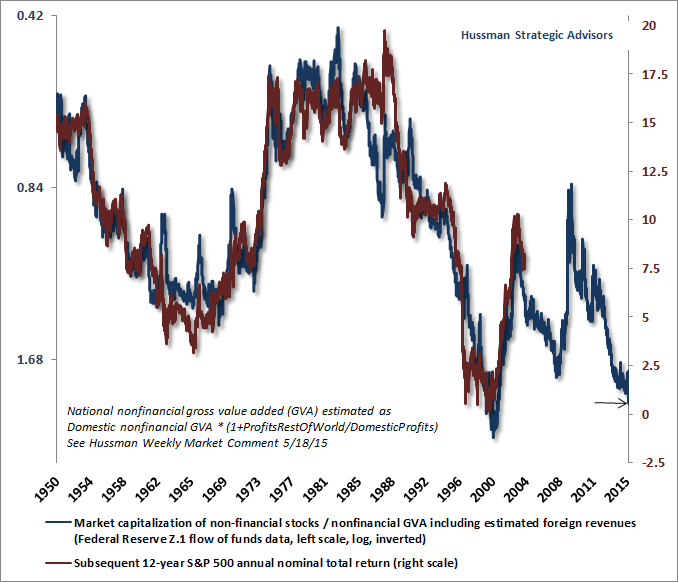 Nearly the same outcome for nominal returns also followed the late-1968 extreme, and the outcome was identical in real terms, as the S&P 500 followed both extremes with negative real total returns over a 12-year horizon. The singular consequence of years of intentional Fed-induced speculation and zero interest rate policy has been the third speculative bubble in 15 years. We view this bubble as being in a late-stage top-formation. Market internals have deteriorated across a broad range of individual stocks, industries, sectors, and security types (including debt securities of varying creditworthiness), and this deterioration indicates that extreme valuations have now been joined by a persistent shift toward risk-aversion among investors. When investors are inclined to speculate, they tend to be indiscriminate about it. The result is uniformly advancing market action across a broad range of risky investments. The condition of investor risk-preferences, as conveyed by the uniformity or divergence of market internals, has historically been the central feature that distinguishes a bubble that continues to advance from a bubble that is prone to vertical collapse. Put simply, market internals are the hinge that determines whether an overvalued market advance is likely to persist or collapse. Understanding this was central to distinguishing the tech and housing bubbles from their subsequent crashes. I’ve regularly detailed why we failed to benefit from this lesson during the recent Fed-induced bubble, and it’s essential to understand that narrative before the opportunity to defend against a likely oncoming market collapse is lost. In 2009, following the financial crisis that we had anticipated, the severity of market and economic outcomes became “out-of-sample” from the standpoint of the post-war data our classification methods were based on. I insisted on stress-testing our methods against Depression-era data - which made them much more robust to extreme market outcomes. But those methods of classifying market return/risk profiles also picked up another historical regularity: in market cycles across history, the emergence of sufficiently extreme “overvalued, overbought, overbullish” conditions was regularly followed by steep air-pockets, panics or crashes. As a result, I immediately took a defensive outlook when those conditions emerged. But if quantitative easing made the recent bubble “different” from other market cycles across history, it did so by intentionally encouraging persistent speculation even after extremely overextended conditions emerged. In the presence of QE and zero-interest rate policy, one had to wait until market internals deteriorated explicitly before adopting a strongly negative market outlook. We imposed that requirement on our methods in mid-2014. That single adaptation could have spared us a great deal of frustration in recent years. Having addressed that issue in mid-2014, I’ve embedded the central lesson in dozens of these weekly comments, because detailing the importance of market internals in navigating valuation bubbles and crashes across history (including those since 2000) overshadows whatever risk there may be in repetition. Frankly, it strikes me as foolish that some observers would prefer to use my error in this cycle as a pretense to ignore objectively obscene valuations on historically reliable measures, rather than learning from this experience in a way that might help shield them from violent market losses that now appear inevitable over the completion of this cycle. That said, I have no objection to investors following a passive investment stance, provided that they’ve aligned their portfolio with their investment horizon and actual risk tolerance (allowing for the possibility - in my view the likelihood - of an interim loss on the order of 50%, as the market experienced in 2000-2002 and 2007-2009). It’s not clear to me that the existing volume of outstanding equities could actually be absorbed by investors at their current valuations if investors were to properly align their portfolios with their risk tolerances and investment horizons, yet somebody has to hold every share of stock outstanding, at every point in time. Hopefully, those choosing speculative investment positions at these valuations have at least considered and rejected our concerns. Last week brought another development matching what we observed both in 2000 and 2007. In addition to anticipating the market collapses that followed those extremes, I am among the few economists who correctly warned of oncoming recessions in October 2000 and again in November 2007 - both points where the consensus of economic forecasters indicated no expectation of oncoming trouble at all. In both instances, the earliest signal of economic trouble came from our Recession Warning Composite, coupled with deterioration in broad market internals. The evidence driving our present concerns does not rely on data that is subject to revision, has not been in place since the global financial crisis, and suggests that the U.S. economic outlook has now turned toward not just the risk but the guarded expectation of recession. I use the word "guarded" because we should acknowledge that this time may be different, particularly in the event that broad market internals improve substantially, but we should also emphasize that recession is now the base case. A possible Fed rate hike has nothing to do with the expectation of recession, and again, the main factor that would reduce our concerns wouldn’t be easy Fed policy but rather an improvement in market internals. As in 2000 and 2007, economic weakness is not apparent if one focuses on lagging indicators such as employment. While our economic concerns are based on a much broader set of evidence than our relatively narrow Recession Warning Composite, we’re not pounding the table about recession - the combination of extreme valuations and poor market internals already holds us to a defensive investment outlook, and further economic deterioration will be necessary to confirm this very early expectation of recession. I should immediately acknowledge that I incorrectly expected a recession in 2011-12. Given that the consensus of economists has never correctly anticipated a recession at any point in U.S. economic history, the fact is that any approach that is sensitive enough to identify a recession early on runs the risk of an occasional false signal (the classic dilemma between Type-I vs Type-II errors). As I noted several weeks ago, the signal from our Recession Warning Composite in 2011-12 was triggered by a shortfall in employment growth (which we had used as an alternate to condition 4 below) that was subsequently revised away, so the last signal on this composite in the revised data appears during the global financial crisis. Our current concerns aren’t driven by data subject to revision. 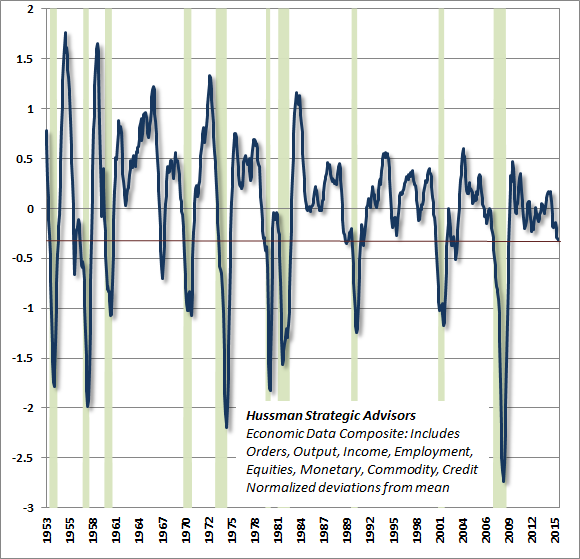 Moreover, as Bill Hester has nicely demonstrated, tepid economic data has significantly different implications for recession depending on whether or not the equity market is weakening as well. During the 2011-12 period, we never saw the ISM Purchasing Managers Index below 50 when the S&P 500 was also below its level of 6-months earlier. Prior to this week, the last time we observed even that basic combination was in 2009. As with our other challenges in this period of extraordinary monetary distortion, a greater emphasis on market internals (which we imposed on our methods in mid-2014) would have spared us a great deal of frustration in recent years. A broad improvement in market internals would reduce the immediacy of both our market concerns and our economic concerns. At present, however, our view is that both financial and economic risks are substantially elevated. We certainly believe that reckless Federal Reserve policy has contributed to both, by creating an environment that fostered persistent speculation and misallocation of capital. But regardless of whether the Fed hikes or doesn’t hike interest rates in the coming weeks, don’t think for a second that such a move will be the actual reason for disruptions that are largely baked in the cake already. 2: Moderate or flat yield curve: 10-year Treasury yield no more than 2.5% above 3-month Treasury yields (this doesn't create a strong risk of recession in and of itself). 3: Falling stock prices: S&P 500 below its level of 6 months earlier. Again, this is not terribly unusual by itself, which is why people say that market declines have called 11 of the past 6 recessions, but falling stock prices are very important as part of the broader syndrome. 4: Weak ISM Purchasing Managers Index: PMI below 50. While this simple composite has a strikingly reliable record in identifying oncoming economic weakness compared with numerous popular alternatives, it’s important to review a broader set of economic measures for confirmation. The first is our familiar review of regional and national Fed and purchasing managers’ surveys. The continued deterioration in leading measures, particularly new orders, is notable. 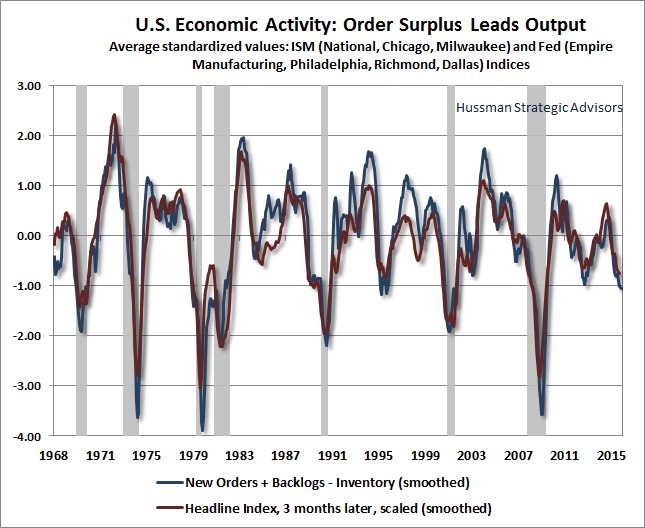 As I’ve often observed, one of the more reliable leading measures of economic activity comes from what I’ve called “order surplus”: new orders, plus backlogs, minus inventories. The chart below presents this measure since the 1960’s. The current deterioration is likely to place continued downward pressure on measures of production and income. Remember also that employment measures are not leading or even coincident indicators, but are instead lagging indicators that typically confirm, in hindsight, what the state of the economy was several months earlier. 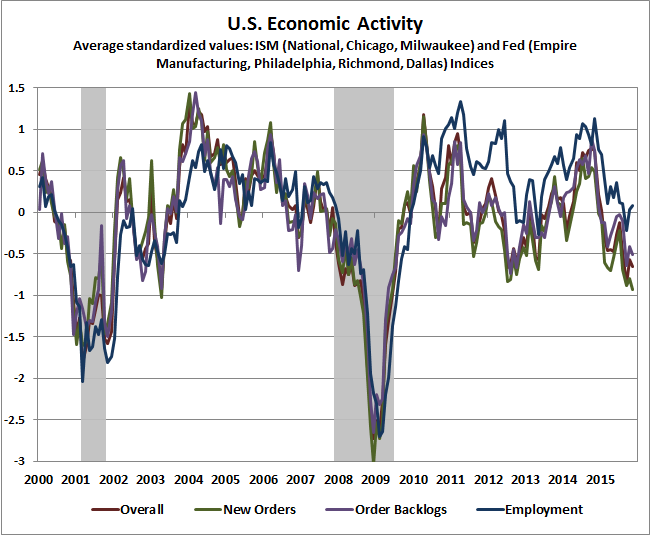 While regional and national Fed and purchasing managers surveys have quite a good record as leading indicators of economic activity (particularly when combined with financial market indicators), they are emphatically survey-based measures, and are not quantitative measures of orders or output. In order to track economic activity more broadly, we follow dozens of measures relating to orders, real output, retail sales, capacity use, employment, income, monetary variables, credit spreads, commodity prices, equity markets, hours worked, and so forth. The chart below shows a composite of these measures, scaled in standard deviations from the norm. The red line shows the current level of economic activity across this very broad set of measures. The green shaded areas are U.S. recessions. Finally, the chart below provides a slightly different view, showing only the points where the S&P 500 was below its level of 6-months earlier, in monthly closing data, and setting other points to zero. 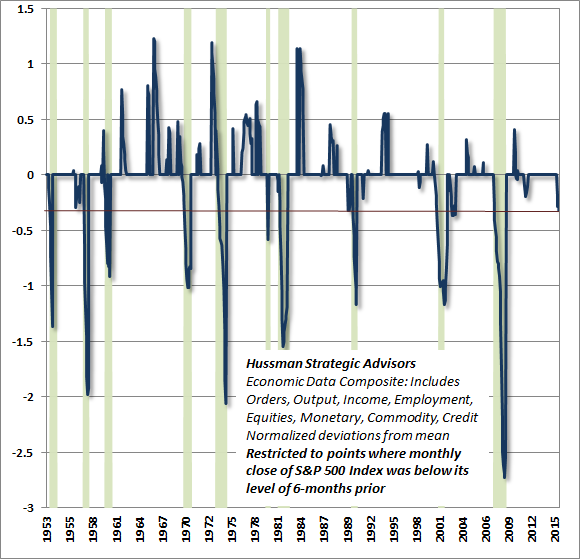 Notably, when the S&P 500 has been down over the preceding 6-month period, the present level of economic activity has always been associated with oncoming U.S. recession, except for a brief post-recession dip in 2003. If the recent bubble period should encourage anything, it should be to allow the possibility that risks could be deferred (though probably also made worse in the long run) by a return to speculative, risk-seeking behavior. Suffice it to say that the risk of recession is elevated here. We needn’t claim certainty, and I don’t believe that the monetary and speculative distortions of recent years encourage it. The main point at present is that we now view an oncoming U.S. recession as significantly more probable than not. In the presence of obscene valuations, deteriorating market internals, widening credit spreads, and tepid economic activity on the most historically reliable measures, we presently observe the same essential syndrome of risk factors that allowed us to accurately anticipate the 2000-2002 market collapse and recession, as well as the 2007-2009 global financial crisis. Emphatically, a return to risk-seeking behavior among investors, as evidenced by a clear improvement in market internals across a broad range of individual stocks, industries, sectors and security types (including debt securities of varying creditworthiness) would defer the immediacy of both our market and economic concerns. In the absence of a shift to risk-seeking behavior (which even a return to Fed easing would not ensure), my view is that the likelihood of a severe market downturn and a U.S. recession has substantially increased.